Since then Lalaloopsy fans were eager to see these after the release of Alice and Scoops. They have a clearer view now. As a matter of fact, you can already get them. 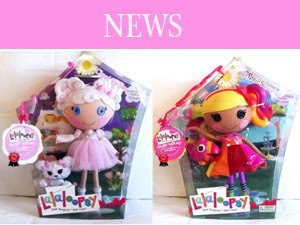 Lalaloopsy Doll, Cloud E Sky and Lalaloopsy Doll, April Sunsplash can already be bought online from Amazon. Cloud E. is a fair skinned lalaloopsy girl with sky blue button eyes and bright, soft pink blushing cheeks. Her hair is pure white with mostly straight wrap bangs with many curls. Her hair is worn in curly pigtails/buns with a single pale pink bow on the left. She has a silver hao and small white stars near her left eye. She also has wings. Cloud wears a soft pink and white themed dress with princess puff long sleeves ending by her wrist and a semi-transluscent skirt pieces over a puffed skirt. Her shoes are pale pink with white ribbons at the toe and white socks. The idea behind an angel Lalaloopsy has been suggested by the fanbase countless times, it is unknown if MGA Entertainment used this popular idea or came up with it on their own. Cloud E. is the first Lalaloopsy to use the same eye color of another Lalaloopsy character, Bea Spells-a-Lot.Her pet poodle is a more detailed improvement of Suzette La Sweet's. Isn't she pretty? She actually look similar to Suzette but this angel Lalaloopsy is really so adorable. Can't wait to get one! April has tan skin and black button eyes. Her hair is yellow, red, and pink and it is in the first Lalaloopsy side ponytail. April also has a red headband. Her dress top is pink and short sleeved with an orange belt. The dress skirt is yellow, orange, red and pink and it looks like an umbrella (sort of). April has purple leggings and green shoes with a little bit of pink at the top and white toes. April's pet is a pink toucan! There is a stripe before it's red beak, and the stripe is yellow. She is the first Lalaloopsy with a side ponytail. Although lalaloopsy are American, she and Cloud E Sky were first seen in the English Argos catalogue. So colorful isn't she? She looks unique with that side ponytail. One look at her would make us think that she really has that lively personality. This is so exciting! After the release of Scoops Waffle Cone and Alice in Lalaloopsyland, Cloud and April will be the next lalas on your list. They are actually not yet out in the market. I also wonder how some fellas got them on sale in Amazon..hmmm. Well, that's all for now. I know there had been so much lala stuff here. But I can't help it! These dolls are just so cute! Please Like us in Facebook to receive updates. yes sis, its kinda hard to find these dolls. but they are available in amazon and ebay. they always restock in amazon. cloud e. sky is so adorable! !